If you prefer your online slots to be more traditional and play more like reel slots then Cleopatra's Gold might be the game for you. This 5 reel, 20 payline Real Series slot from RTG is currently available to play at a number of online casinos offering RTG software and slots. If you have played IGT's iconic classic Cleopatra slot or Aristocrat's Egyptian slot Queen of the Nile then you will be familiar with how this slot game plays. The symbols on the reels are all related to all things Ancient Egyptian such as the Eye of Horus, Cleopatra herself, a cat, Egyptian jewels and the regular 9-through-to-Ace symbols in a hieroglyphic style font. There is a free spins bonus round when you get 3 or more pyramid Scatters on any of the 5 reels. This can re-trigger during the bonus game, adding a further 15 free spins. 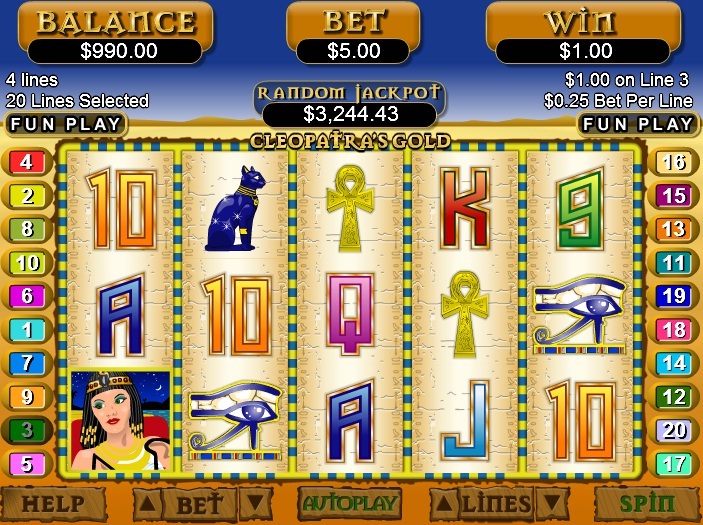 There are wilds on all reels, which is the Cleopatra symbol as in most of these Eygptian-themed slots. There is a random jackpot ticker that sits above the game. This can be won on any spin, but your chances of winning it are greatly increased by playing a bigger coin size. 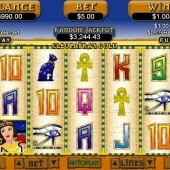 I tend to prefer my video slots to be a bit more exciting and I find Cleopatra's Gold a little slow and clunky. But, considering it is one of RTG's most recognisable slots, it is a game that I play on occasion. You might also want to consider other RTG slots, including the Japanese-themed Ronin slot or the underwater Crystal Waters slot.